With the CG animated film being released there were a slew of movie tie-in games. For some reason the Nintendo DS version got the shaft, even worse than the Sony PSP version which had far superior graphics if I remember correctly. Whoever thought this game should be the precursor to all the "Such-and-such RUN!" games should've been fired. 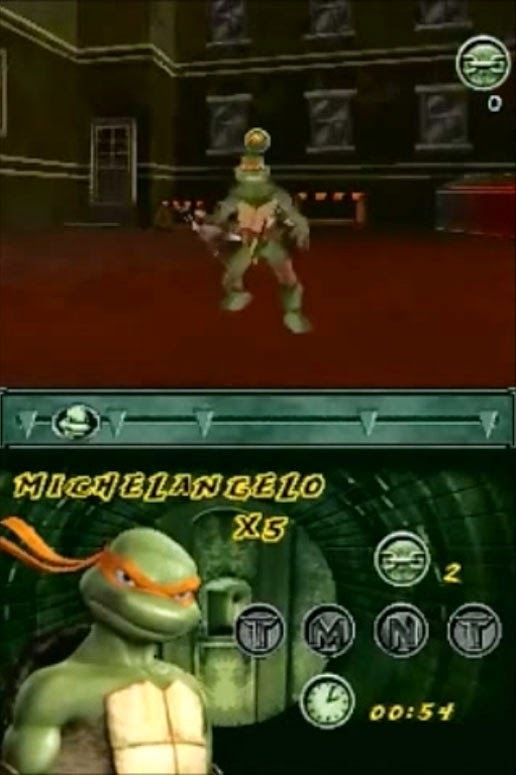 There is the only the most minimal combat in this game and ignoring the TMNT's staple game mechanic throughout the years was this games first and biggest mistake. In those few moments the controls are garbage- they contain the most pitiful combos I've ever seen. Since each normal attack pushes you forward quite far, sending you far beyond Foot soldiers if you are even slightly off target, it leaves you wide open to get cut down. Really, it comes down to spamming the attack button and hoping for the best. What comprises a majority of the game is running through the city and dashing back and forth responding to button prompts to jump or swing in the most clunky and sloppy way possible. It is a considerable part of the game, to an absurd extent- all you do is push one of three buttons- left, right, or center- ad nauseum. This costs the game a lot because it eliminates any real exploration they might've had and sapped any enjoyment they could've had in this game. To make matters even worse there are corners that cameras aren't fast enough to follow you around, moving jump points that can lead directly to death if the landing point moved, and areas where you have to "charge" a jump by holding the button down for no real reason I could discern. The one thing that was kind of redeeming is a mini-game of sorts where one of your turtle brothers shows up and if you can race and catch them, they'll launch you far ahead for a boost in time to complete the level. Unfortunately the boost only serves to help you retrieve the collectible token letters T, M, N, and - you guessed it - T. But trying to collect them is a chore because the whole game is awful- so I didn't even bother attempting it, which would necessitate replaying levels to take different paths for the letters I hadn't found. TMNT may have begun with an original idea that was initially great, but somewhere along the line it became the befuddling mess we got. I've played a LOT of Teenage Mutant Ninja Turtle games over the years, and this one is easily the worst. Even Out of the Shadows is a masterpiece in comparison.